Sugar, East Anglian Strawberries, Gelling Agent: Citrus Pectin, Acidity Regulator: Citric Acid. Sugar, Morello Cherries, Gelling Agent: Citrus Pectin, Acidity Regulator: Citric Acid. Prepared with 55g of fruit per 100g. Sugar, Seville Oranges, Gelling Agent: Citrus Pectin. Sugar, Butter (MILK) Lemon Juice (11%), EGG Yolks, Whole EGGS, Acidity Regulator: Citric Acid, Gelling Agent: Citrus Pectin, Lemon Oil. Made using free range eggs. Allergen advice: For allergens see ingredients in CAPITAL lettering. 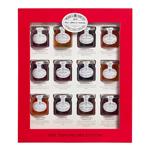 Big Ben gift pack containing three mini jars. An English Big Ben gift pack containing three mini jars. Sugar, Raspberries, Gelling Agent: Citrus Pectin, Acidity Regulator: Sodium Citrate. Prepared with 52g of fruit per 100g. Apricots, Sugar, Acidity Regulator: Citric Acid. Prepared with 70g of fruit per 100g. Golden Syrup (Invert Sugar Syrup), Condensed Skimmed MILK, Butter (MILK), Double Cream (MILK), Maldon Sea Salt. Sugar, Strawberries, Gelling Agent: Citrus Pectin, Acidity Regulator: Citric Acid. Prepared with 47g of fruit per 100g. A blend of Chinese Acacia & Fennel honey. Contains three jars with ; Strawberry and blackcurrant preserves and orange marmalade.